It’s no secret that Colorado is considered one of the fittest states in the country, sporting the lowest obesity rate, and residents who love to pursue outdoor activities. Many top-notch athletes make their home here, including triathletes, runners, bikers, and yes, even Olympians. So it should come as no surprise that one of the most torturous hiking “trails” in the state would become a major attraction near one of its largest cities, Colorado Springs. 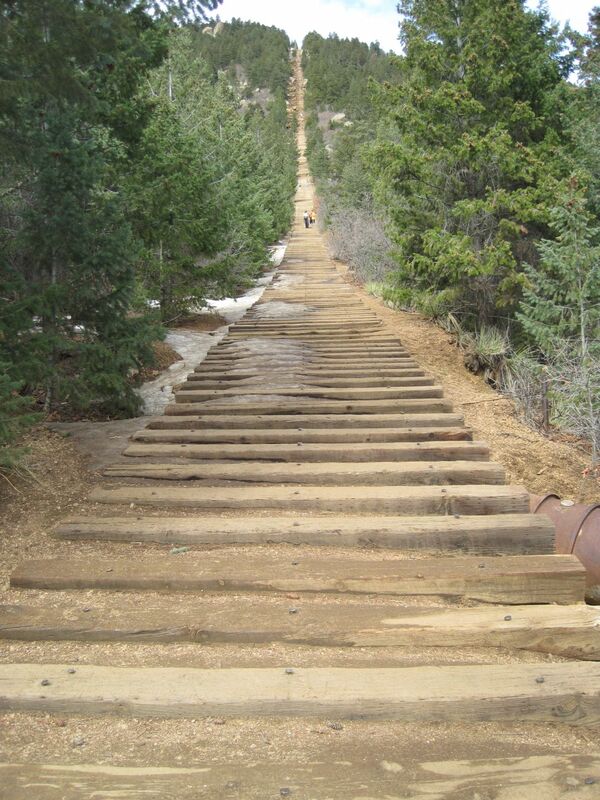 Yes, I’m talking about the notorious Manitou Springs Incline Trail, or should I say the Satanic stairmaster? Because a climb up it is hellish indeed. 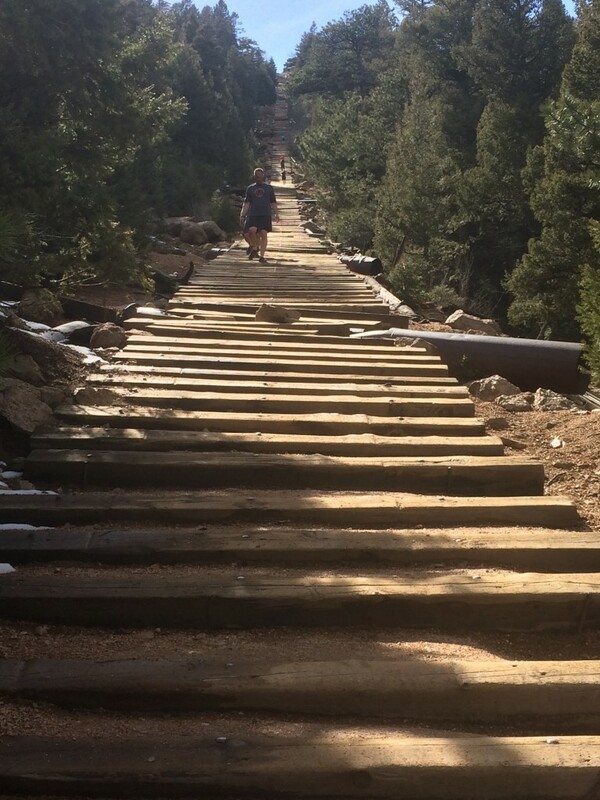 The Manitou Incline was originally built in 1907 as a cable car route in Manitou Springs to carry pipeline for a hydroelectric plant. After construction was completed, it turned into a tourist attraction, boasting a 16-minute ride to “scenic splendors.” Due to the steep nature of the incline, it proved costly to maintain because of constant rock slides along its route. Though immensely popular with tourists, one final rock slide brought about its permanent demise in 1990 and the rails were torn up. 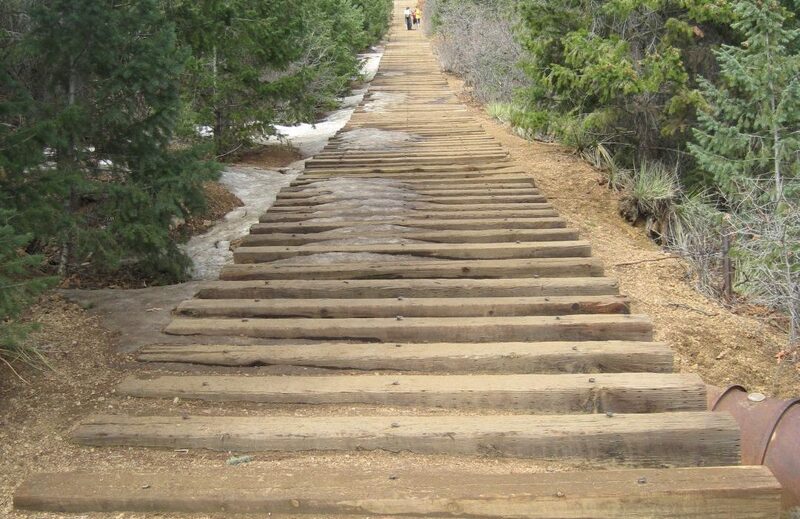 Soon after its closure, athletes seeking the ultimate fitness challenge started hiking up the railroad ties, using them as “stairs”, despite the fact the trail crossed private property, and they were technically trespassers. Finally in January 2013, the legality of the Incline was laid to rest when the Cog Peak Railway and Forest Service reached an agreement, making it a legit trail. I first became acquainted with the Incline a couple of years ago, when Bryon and I were staying in Manitou Springs for the weekend. We went to hike the Barr Trail, the 13-mile trail ascending up to the summit of Pikes Peak. When we made our way to what we thought was the Barr Trail Trailhead, we saw hordes of people heading up what looked like wooden stairs. When we went over to see what they were doing and peered up the hillside, my jaw dropped open. You’ve probably heard of the Lead Zeppelin song, Stairway to Heaven. Well, there was an army of people, slowly, every so slowly making their way up what looked like the Stairway to Hell. What was it and why would anyone want to torture themselves that way? 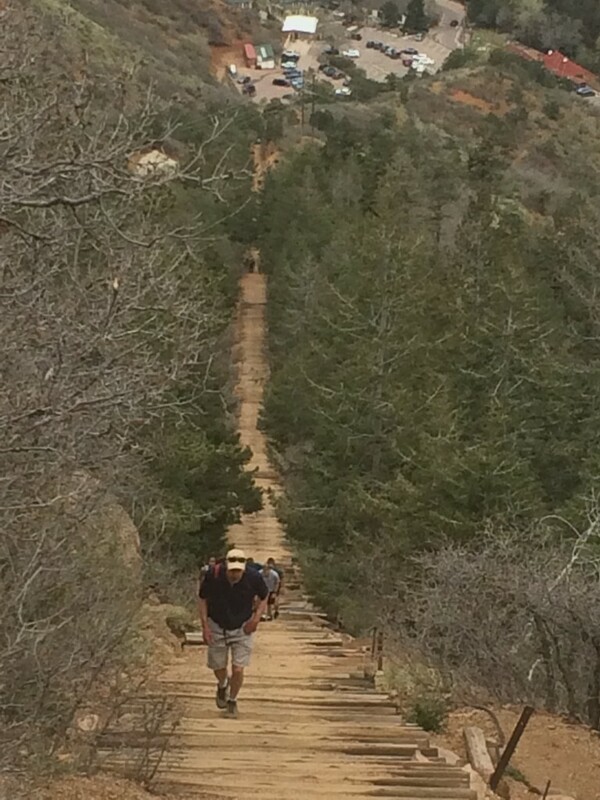 After doing a little research on the Internet, I learned about the love-hate relationship people have with the Manitou Incline. For a state full of people obsessed with climbing 14,000-foot mountains, what better way to test your fitness than to grind up .88 miles while climbing over 2000 feet? There is all kinds of lore attached to the Incline, some including Olympic athletes, who train in nearby Colorado Springs at the Olympic Training Center there. Apolo Ohno has one of the fastest ascents of the Incline, completing it in a mythic 17 minutes and 45 seconds. But that’s not the record, which is reportedly held by professional triathlete, Mark Fretta, who finished in a blazing 16:42 according to The New York Times. The Incline even has its own version of a marathon, the Inclinathon, which is 13 complete round trips to make the 26+ miles distance. What makes all of this that much more impressive is the fact that the Incline begins at 6500 feet and finishes at 8,590 feet. Knowing all of this, as I went on an overnight trip to Colorado Springs this week, I decided I was ready to give my best shot to climbing the Incline. I decided to go on a Tuesday, figuring there would be less people to witness what I figured could be an embarrassing display of huffing and puffing compared to these uber-athletes. After I found parking, I psyched myself up and made my way to the signpost signaling the start. I looked up, trying not to feel intimidated. I figured, just for fun, I’d start my Stopwatch on my iPhone to see how long it did take me, and off I went. At first, it didn’t seem so bad, the steps were not very steep and the grade was okay. Yes, I can do this. Then the grade started to steepen. In my mind, the one thing I didn’t want to have to do was stop and sit down along the way, so I eased up my pace, determined to just keep moving. Just as I thought this ploy to play the tortoise was working, the grade got even steeper, and the steps became twice as high. What kind of cruel joke was this? I resorted to another strategy of climbing ten steps and pausing, climbing ten steps and pausing. I was afraid to even look at the heart rate monitor on my Fitbit — I kept expecting it to sound some sort of alarm — “HEART ATTACK IMMINENT — BAIL OUT, BAIL OUT!” I turned around to see an older man with gray hair quickly advancing on me. I can’t let him pass me — pick up the pace. Finally at the bail out point, where you can exit this torture chamber prematurely to the Barr Trail, he left — thank God! Back to the climb, at this point, I was stepping up one step, then bringing the other foot to the same step, pause, and move on. Can’t stop and sit down, despite my labored breathing and my heart feeling like it is going to explode. I peek up the stairs and it looks like I’m nearing the top, but no! — it’s a false summit, and it gets even steeper. Thankfully, the steps do become regular-size steps and I see people sitting on a rock up above me — I can make it, and I climb the last 25 steps as quickly as possible. Yes – success! I click stop on my stopwatch and I’ve finished in 50 minutes and change. I sit on a rock, call Bryon to tell him of my accomplishment, and take the easy way down via the Barr Trail. I’m feeling good about my accomplishment and proud to say I’ve done the Incline. Then I already start thinking how I can shave off some time to break 45 minutes the next time — yep, it’s true, I’ve become hooked. Now I understand all those hordes of people going up the Incline every weekend — I’ve just become one of them. And on the seventh day….